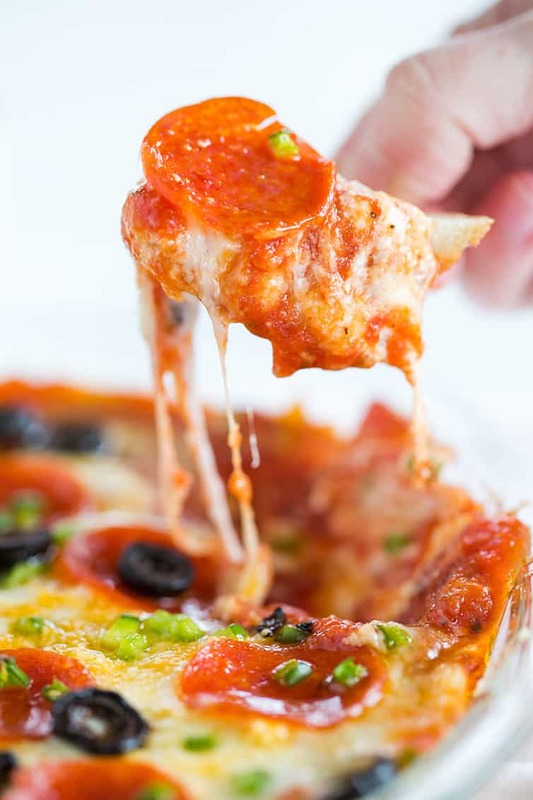 This easy pizza dip recipe features layers of mozzarella and Parmesan cheeses, pizza sauce, and your favorite pizza toppings. Always a hit! One of my favorite weeks of the year (aside from the week before Christmas) is the week before the Super Bowl. At no other point in time is it possible to find so many amazing appetizer and dip recipes. Right behind my love of desserts comes my love of appetizers, specifically dips. Which means that on a day like Super Bowl Sunday, I am in a state of food nirvana. I love the excuse to try out new recipes and declare new favorites. 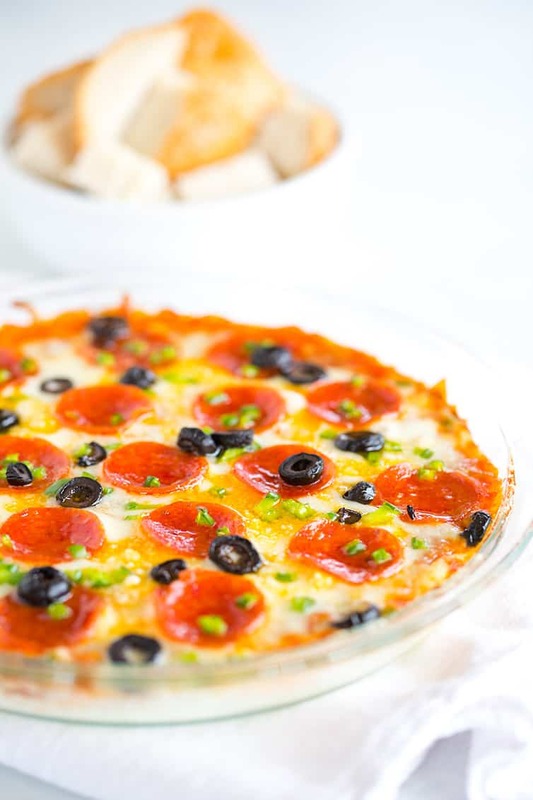 This easy pizza dip is super simple and combines all of the crave-worthy flavors of a pizza without the need to toss dough, preheat a pizza stone, or bust out the pizza peel. An awesome compromise for the sake of dip. 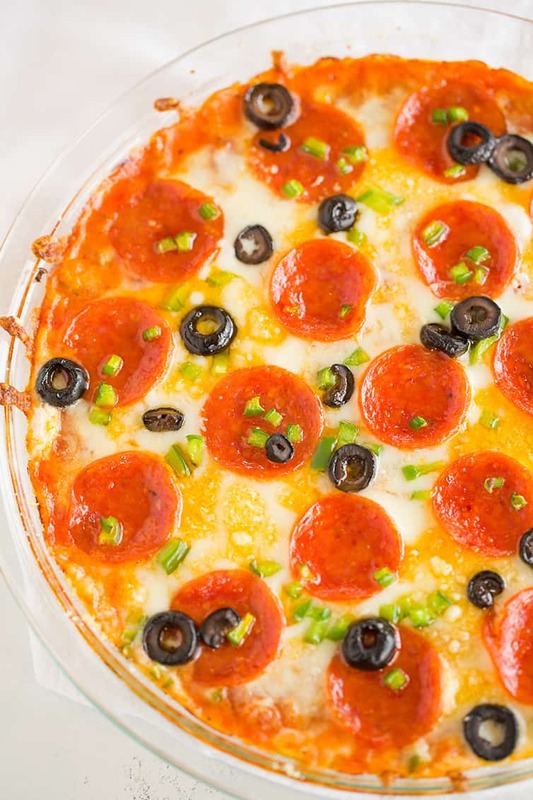 This crazy delicious baked pepperoni pizza dip is made with cream cheese, mozzarella and Parmesan cheeses, pizza sauce, and your favorite pizza toppings! Bust out your favorite pie plate and slather the bottom with a layer of cream cheese, top that cream cheese with shredded mozzarella and Parmesan cheese. Then add a layer of your favorite pizza sauce (I love DeLallo when doing store-bought, but I also have a favorite homemade pizza sauce, too), top with more shredded cheese, and then finish it off with your favorite pizza toppings. I am definitely a purist when it comes to pizza – I am a pepperoni pizza girl pretty much 100% of the time, but I do love the combination of pepperoni, black olives and green pepper for a variety of flavors here. Feel free to switch it up though, whatever you like – mushrooms, sausage, bacon, veggies – possibilities are endless! What do you serve with pizza dip? So many options! You could certainly serve this with other things, but I really like very lightly toasted baguette slices or chunks of crusty bread, like a country sourdough. They hold up well to the sauce and melted cheese, and they mimic a crust beautifully. Happy pizza dipping, everyone! What would your ideal toppings be? Spread the cream cheese over the bottom of a 9-inch pie plate. 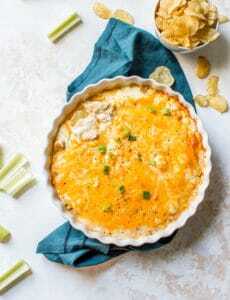 Top with ½ cup of the shredded mozzarella and ½ cup of the Parmesan cheese. Spread the pizza sauce on top of the cheeses, and then top with the remaining ½ cup of mozzarella cheese and ½ cup of Parmesan cheese. Top with pepperoni slices, chopped green pepper and sliced black olives. Bake until the cheese is melted and bubbly, about 20 minutes. Serve with your favorite bread, toasted baguette slices, or chips. I like the "supreme" style topping combo of pepperoni, green peppers and black olives, but feel free to use your favorite pizza toppings, whatever they may be! Can this be served cold? I was thinking of taking it to a Super Bowl party and don’t want to have to use their oven. Made this with my daughter for Super Bowl. Simple to assemble and it tastes great! I have prepared the version I have many times, plan to try yours with the small differences to see which one we favor. Love your posts and the pictures of your children. My favorite toppings are pepperoni, green olives with pimentos, and roasted red peppers. Got hooked on this combo 3 decades ago at Villa Pizza in “duhntuhn” Pittsburgh, around the corner from the Alcoa building. Would be awesome in your dip! Thanks. I have been making a very close version of this recipe for nearly 30 years. Our grown sons still love this and make it at their own homes now. I got the recipe from a Junior League cookbook. Delicious!! Looks so delicious and colorful! YUM! EASY! AWESOME! I didn’t have pepperoni on hand but used mushrooms. YUM! So easy & so good!! After baking, I blotted the top with a paper towel to remove some of the pepperoni grease. Made this for book club & the girls loved it! And, this would be the perfect Super Bowl dip!! 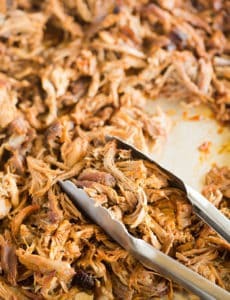 omg I’ve been scouring the web for recipes for my finances b day party and this looks incredible!!! I’ve made Pizza Dip before. It always goes over well. This looks so good with the pieces of pepperoni on top. this is such a fab idea!!! especially so for those who have difficulty making pizza dough (like myself). this looks amazing, i could almost smell it from my screen!!! Thanks for sharing!! 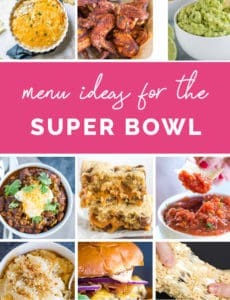 I am trying this right now for super bowl and hope that it comes out as great as your looks! Oh man this pizza dip looks incredible! I love the pic of it flowing over the side of the slice of bread. Mmmm, totally into the pepperoni pizza deal, love the recipe! Did you use Parm out of the can or shredded? Thanks Kathy! Actually, neither. I used fresh grated Parmesan, which is sold in the cheese department of my local grocery store. I’m loving the melty cheese and pepperoni, very enticing! I’m a pepperoni girl too but I love bacon on occasion.